Book: People of the City. We are first introduced to the city by Amusa Sango, a man with a flair for women, words, and music and excitement. The city takes us by the hand after that, it shows us the life of Aina, and Beatrice; women who have the city camped in their veins. It paints us life in the eyes of the affluent of the city; how they fashion the way the city progresses. It is the action of the affluent that would drive Amusa out of his home, out of a job and render him without sustenance. But his problems would first start peeking at him from the eyes of a woman, it would take the shape of an envious rival, and he would suffer on account of a woman who’s love she would rather gift him than the those who would eventually bring him down. But Amusa is made of stubborn heart, he would imagine the city as a bull, and he would take the bull by the horns, shove it aside and, march out of it. The city has no name. 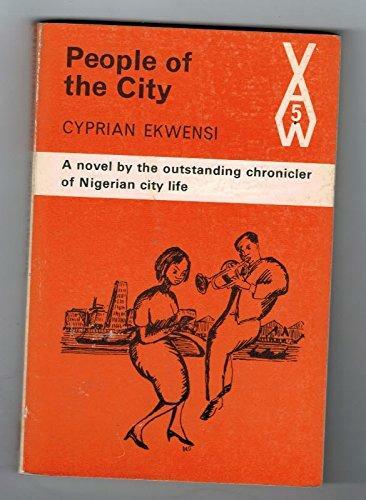 It is easy to imagine what Cyprian saw in 1954 when People of the City was published by Heinemann under its African Writers Series, as this is a familiar story in urban and sub-urban parts of the country. The illusion of fast money, the exchange of vices, the poverty and under employment. What must have been a subtle warning at the time has grown and rooted itself deeply in our society. This is the story of survival, where citizens of the city would go whatever miles to foster connections, claim relations that would ensure their sustenance. And so money would exchange hands; goods would be conscience, innocence, naivety. The city would wash out the good and usher in the greedy, and the opportunistic. It would jab at the hearts of those who hold on to whatever good they preserved. It would steal dreams and cause tears, and it would shelter the broken in its vicious shackles. However, the story would stand out for more than plot and the careful weaving of livelihood, love and politics into an unforgiving city, it would have to its credit the use of simple sentence structures, easy words and simple writing that aides understanding. In between, one would appreciate the binding effect of pain, and calamities, and how humans rally together to celebrate the lows. It would also describe the ill wishes that follow success and why success must find ways to remain on the top of the ladder, regardless of the means. It would truly be a story of just another young man, whose dreams would be seized by the city. But we would recognize this man in every sentence, we would recognize him at every step of his journey, because we would have taken this journey, or at the very least, we would have knowledge of someone who has. Nana Sule is a writer and Environmental enthusiast whose writings have appeared in blogs. She is the Coordinator of the AMAB Book Club and tweets @izesule.